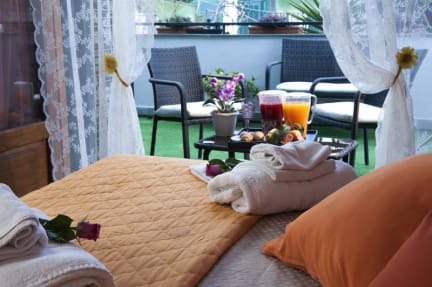 The rooms at B&B Elena are lovely, large with a double bed, single beds and all with private ensuite WC with shower and have a great Italian style forniture. All rooms are located on the first floor of the Villa Elena. B&B Elena is a beautiful Villa in a quiet residential area of Pompei, the perfect place to rest and recover after a busy day out visiting the Archeological Park. You can take advantage of the big garden and the Solarium Terrazze in the summer months, when it is full of colourful flowers and wildlife. Our Villa is in front of the Anfiteatrum Pompei Ruins main entrace and 5 minutes walking from the Center of the new Pompei town Via Roma full of Bar, Pub and Restourant. Wi-Fi available and free in all the rooms. Towels, bed linen and hairdryer provided. All rooms have a private ensuite bathrooms. A private parking in the villa. Best hostel I’ve stayed in! The staff was very friendly, the room was cute, clean and cozy. 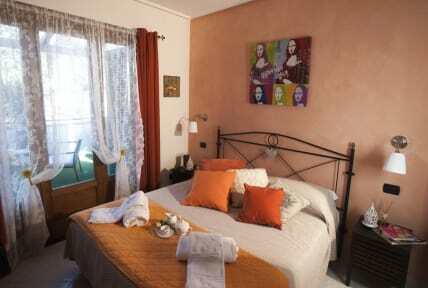 Perfect for a weekend stay and located right next to the entrance to the ruins of Pompeii. Great place to stay, host was very nice, breakfast was a tasty buffet that filled my large appetite!! Would recommend!! The host is very nice. Provided a lot of useful tips. Place was clean. Great location and there’s a really big balcony for everyone to use. Very clean and nicely decorated. Only negatives were that you could hear noise from the road and downstairs and the bed was very uncomfortable. Wonderful stay! Nice location near back entrance to the Pompeii ruins and Irena and her husband were such perfect hosts and fed us a bountiful breakfast! They pay attention to every detail in their place. A great place to stay! It's quite close to the ruins, the city center, and the highway connecting to Naples/Salerno so that's a big plus! The host is a super-friendly guy, and gave tips on which places to see when, and pointed out some neat restaurants to try out too. All in all, a wonderful place to stay at if you're planning to halt for more than a day. Extremely helpful staff and very clean room.